System provides mmediate emergency oxygen for medical or dental office. is available with most of our Emergency Oxygen Systems. Our systems are compatible with most pediatric masks for younger patients. 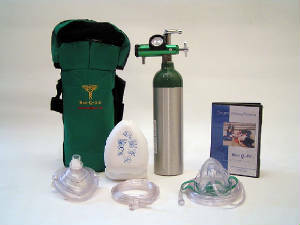 This complete portable oxygen system includes 6 CF aluminum refillable oxygen cylinder, adjustable regulator, oxygen mask and cannula, padded cylinder bag, Training DVD and complete instructions. System weighs 5 lbs. Meets all FDA Requirements for Emergency Oxygen. This complete portable oxygen system includes 9 CF aluminum refillable oxygen cylinder, adjustable regulator, oxygen mask and cannula, padded cylinder bag, Training DVD and complete instructions. System weighs 6 lbs. Meets all FDA Requirements for Emergency Oxygen. ... To buy now, click here. Portable emergency oxygen system for medical or dental office. Includes 15 CF aluminum cylinder (425 liters), adjustable regulator (0-15 LPM), standard oxygen mask, nasal cannula, cylinder cart. 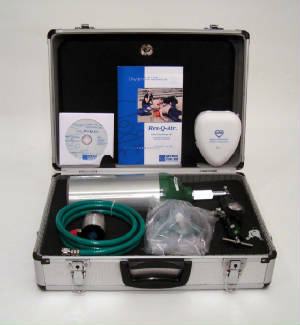 Includes DVD Instructional Programfor CPR and Emergency Oxygen Administration, and instructions. Weighs 12 lbs. 1 Year Warranty on all components. 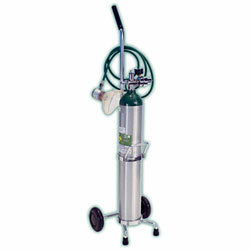 Portable emergency oxygen system for medical or dental office. Includes 24 CF aluminum cylinder (680 liters), adjustable regulator (0-15 LPM), standard oxygen mask, nasal cannula, cylinder cart. Includes DVD Instructional Programfor CPR and Emergency Oxygen Administration, and instructions. Weighs 14 lbs. 1 Year Warranty on all components. 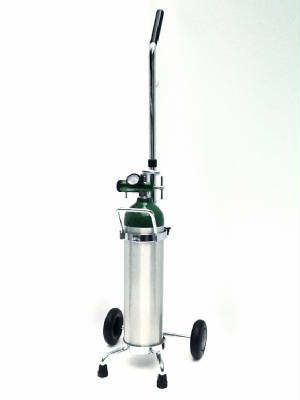 Complete emergency oxygen system with demand valve for medical or dental office. Provides for Emergency Oxygen with CPR. 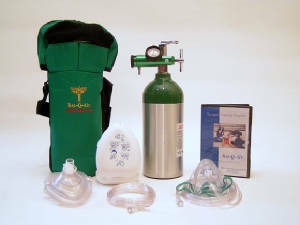 Includes 9CF cylinder (255 Liters of oxygen), 12 position adjustable regulator, demand valve, CPR mask with connecting hose, oxygen mask and lockable aluminum storage case. Weighs 14 pounds. Instructional DVD is included to provide complete training in oxygen administration with or without CPR. 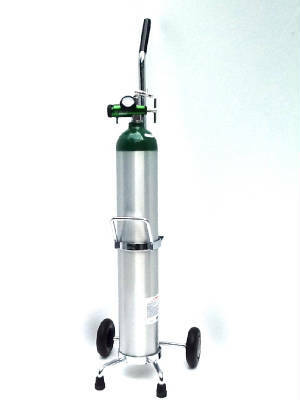 Complete emergency oxygen system with demand valve provides emergency oxygen with CPR for medical or dental office. The demand valve delivers oxygen to a breathing patient or this unit easliy converts to a resuscitator for non-breathing patient. Instructional DVD is available which provides complete training in emergency oxygen and CPR administration. This easy to use portable system provides oxygen for any medical emergency in your office. Dual gauge display for easy verification of both LPM flow and oxygen cylinder contents. The system is self-contained for easy storage and mobility. Manufacturers warranties on all components.